Supplies ticket clippers to New Zealand’s major transportation companies for busses and ferries.we also supply ticket clippers to companies who offer loyalty cards, from coffee shops to major oil companies. Zorex Distributors Ltd ticket clippers are the finest quality with harden metal anvils available in a huge selection of numbers and designs.Our clients also include fire extinguisher service companies and suppliers who use ticket clippers to validate the maintenance cards attached. For every marking application, whether for identification or canceling, you can punch mark it faster with non-removable, easily read punched symbols, letters or figures. The quick operation and mistake proof results of punch marking is utilized in hundreds of industries on the production line and in the office. In addition to punching paper and cards, punches can be made for light metal, plastic, rubber sheeting, cloth, or film negatives. 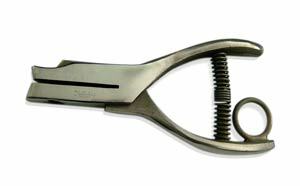 It is our aim to supply all your hand punching needs and solve all your punching problems. The M.C. Mieth line is constantly being studied for improvement in every way. Of course we will continue our strictest rules of highest quality and finish, fastest possible delivery and cooperation at all times with our numerous friends and customers throughout the world.